PTFE stirrers / PTFE agitators are widely used in glass reactors for different stirring requirement, our specially designed PTFE and PTFE lined stirrers are based on vessel size and capacity. Standard sizes of PTFE stirrers for glass assembly are based on stirring volume like 50 Ltr,100 Ltr,& 200 Ltr. for spherical and cylindrical vessels. For viscous liquid agitation please consult our factory for special designs. 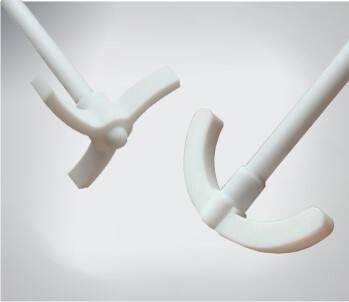 We supply PTFE stirrers as a mixing solutions and products to customers worldwide. These stirrers are used in the chemical & petrochemical, pharmaceutical, biotechnology, polymers and food & grain processing industries.